Vida Amina Yakubu, Susana Asamoah, and Alice Avuworda all mid-wifes from Accra, Ghana, are at Wake Forest University Baptist Medical Center learning more about maternal health care. On any given day at Ridge Hospital in Accra, Ghana, one midwife may care for 15 women trying to give birth. Susana Asamoah is such a midwife. “We need more equipment, more devices and more training of nurses in the hospital,” she said this week. 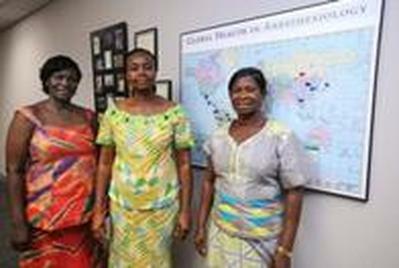 Asamoah and fellow midwives Alice Avuworda and Vida Amina Yakubu are in Winston-Salem in search of help. They are in town for the next several days to observe and learn new skills that can help them at their hospital, the main obstetric referral hospital in Accra, Ghana, a country in West Africa. Their visit was arranged by Kybele, a nonprofit organization that tries to improve childbirth conditions throughout the world, particularly in developing countries. Dr. Medge Owen, a professor of obstetric anesthesia at Wake Forest University School of Medicine, started Kybele about 10 years ago. will serve as models for maternal health care. Owen, faculty members from Wake Forest and Duke University, and nurses from Forsyth Medical Center have all traveled to the hospital in Accra to help make Ridge Hospital the first of these centers. six beds and is understaffed. “We are trying to revamp all the obstetrics services in the hospital,” Owen said. That includes a new nurse anesthesia training program and improving customer care. Asamoah, Avuworda and Yakubu are in the middle of a three-week trip to the area, which has included visits to Duke and Forsyth Medical Center. They said they were impressed with the level of communication among different health-care workers and with the way the workers kept relatives in the loop. At their hospital, relatives are rarely allowed in the labor ward, they said.